CHIROPRACTOR LouisTrichardt Polokwane Tzaneen Warmbaths Find your local DC. Keywords; CHIROPRACTOR LouisTrichardt Polokwane Tzaneen Warmbaths, Drs Jana Logtenberg and Mmapula Maboe. About 200 000 people die EVERY YEAR in the USA from unsuitable medicines, or a bad reaction to a drug, a misdiagnosis, the wrong dose... That's because America consumes about 50% of the world's pharmaceuticals. That's enough people to fill a moderate size city, who die EVERY YEAR. And South Africa is following the same trend. This is known as iatrogenic illness or doctor caused disease. In chiropractic we are not in principle against drugs, but we are committed to keeping our patients off painkillers and anti inflammatory drugs. One part of the solution is, simply and deliciously, walking benefits. Head neck pain, headaches, migraine headaches, jaw joint pain, all demand that you take on a regular ongoing basis large quantities of medicines. Chiropractic believes it has a cogent alternative to offer: When possible find the cause of your headaches and treat the cause rather than the symptoms of your pain. CAM really stands for Complementary and Alternative Medicine. Debate rages, some chiropractors are happy with Complementary to medicine, others feel we are definitely an Alternative, and others want to be part of mainline medicine. I hedge my bets. We certainly offer an alternative to the usual medical approach of drugs and surgery, but in reality we also stand alongside medicine. And it wouldn't bother me if we became part of mainline medicine, provided we retain an element of independence. Like dentists do. DUAL ANTIINFLAMMATORY DRUGS ... the dangers. CERVICAL COMPRESSION TEST ... this is a treat, watch to the end! Something puzzling you? What to submit a question? We try but don't promise to answer your questions. Give rather too much than too little detail. "Can Chiropractic help me with a slipped disc?" is far too vague. Where? When? Injury? Radiating pain? CHIROPRACTIC HELP QUESTIONS ... submit a question. It could also be hip arthritis, or pain radiating to the groin from the back, known as Maignes Syndrome. ANTI INFLAMMATORY DRUGS ... dangerous. And there are a number of other hip conditions like Femero Acetabular Impingement Syndrome and Hereditary Hip Dysplasia that we are now finding are far more treatable with chiropractic than previously thought. 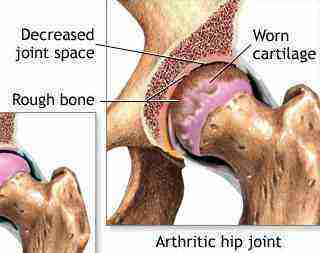 Neglected, they lead unerringly to hip arthritis. The health of the hyaline cartilage that lines all the bones in your joints is utterly dependent on the right nutrients. Many of them, but recently scientistists have identified the Omega-3 essential fatty acids in fatty fish (read more about Mackerel recipes) and flax seed, and walnuts, and butternut as crucial to the health of your joints.